Rindge is a small town on the southern boundary of Cheshire County, immediately north of the Massachusetts border about halfway across the State of New Hampshire. Incorporated on February 11, 1768, it still retains much of its small town flavor while providing many convenient locations for groceries, health care products, dry goods, entertainment, banking services, alcoholic beverages, as well as medical, dental and legal services. Scattered throughout the town you will find farm stands, antique shops, B&Bs, baskets, and yes, you can even see sap from the maples boiled down to syrup in the early spring. With 18 great ponds throughout the town ("great ponds" are bodies of water over 10 acres in size) there are naturally opportunities for boating, both power and sail, as well as swimming and fishing. Winter offers skating, skiing, ice fishing and even ice boating. 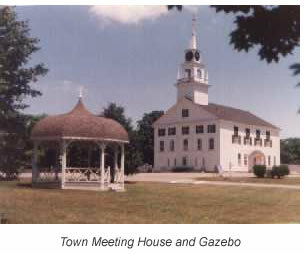 The center of the town is identified by the Town Meeting house pictured above. Built in 1796, it remains one of the few remaining structures used by both the town government and a church group. Opposite the Meeting House is a green park with a wonderful new addition of The Smith Pavillion for band concerts, weddings, and other community affairs. Holiday lighting has become a welcome addition to the park. Lake Monomonac is the largest of the "great ponds" containing 710 acres and is one of the few interstate lakes in NH, sharing approximately half of its water line with Winchendon, MA. A unique feature of the lake is the imposing bow of the ship, the "Santa Maria" facing northward up the main body of the lake. 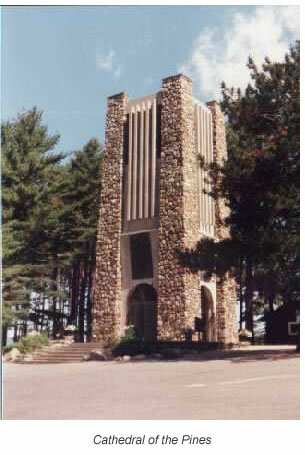 Built in 1942 of rock and concrete, it is a bit of whimsy by a priest, Father Wilfred A. Tisdale, as a vacation retreat and to display and enjoy his collection of rare works of art of genuine museum quality. The "Santa Maria" was a feature article in "Yankee Magazine" in July, 1967. Since that time it has been privately owned by several families, once by the well known singer Kenny Rogers, who found the unique features attracted too many people and interfered with his privacy. Educational facilities are varied for a small New Hampshire town. Located here are: Franklin Pierce University, a four year liberal arts college; Heritage Christian School, a private Christian school; Hampshire Country School, a private boarding school; and the Rindge Memorial School, the public school for Grades K-5. The middle and high schools are located as part of the cooperative school district in Jaffrey. Employment opportunities are somewhat limited within the town with about 65% of the residents commuting elsewhere. The town's access routes are US Route 202 (north and south) and State Route 119 (east and west) therefore, the commute is easily accomplished to Nashua, Keene and Manchester, New Hampshire or Gardner, Fitchburg and Leominster, Massachusetts.